The English word urchin originally referred to the hedgehog, and the Sicilian (and Medieval Italian) riccio still does. In former times the sea urchin's "spines" were compared to those of the creature that resembles a porcupine. 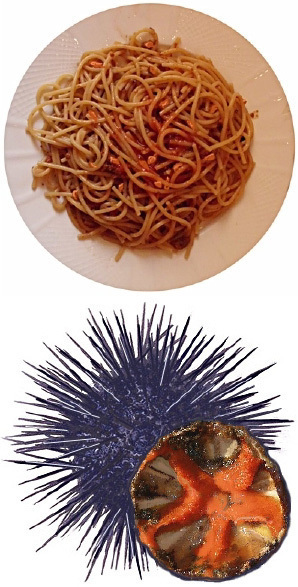 Since hardly anybody eats hedgehog anymore (it's a protected species still seen in Sicily), it seems fairly obvious that ricci served with pasta are sea urchins, which have been consumed in the Mediterranean region from the most ancient times. Sea urchins are rather small, spiny, creatures having a hard, globular shell, the test (from the Latin, French and Italian words for "head"), which is usually less than ten centimetres in diameter. They live in all the world's oceans and in the Mediterranean Sea. While urchins vary in size and colour, those in the Mediterranean are usually a dark, purplish hue, almost black, with the test averaging just over six centimetres (almost three inches) in diameter and the spines adding another few centimetres. With sand dollars, they make up the class echinoidea in the echinoderm phylum. More broadly, the phylum also includes crinoids, star fish and sea cucumbers. "Echinodermate" literally means "spiny skin" in Classical Greek. Regarded as something of a delicacy today, urchins are eaten raw and feature in the cuisines of most Mediterranean cultures. Efforts have been made to discourage over-harvesting. Unlike mussels, urchins are not raised on farms, though this may change as they become scarcer in the wild. The mouth of the urchin is in its lower half, and the shell is actually divided into five parts. None of this is very obvious to the untrained eye. It is thought that the spines of some urchins are poisonous, but those in the central Mediterranean are just painful when they get stuck in your hand. Heavy gloves are essential equipment in harvesting and cracking open (with a hammer or meat cleaver) fresh urchins. And fresh is the only way they should be eaten. It may seem like a culinary cliché, but canned urchins have no flavour. The point is that fresh urchins don't have a "fishy" odour or taste. Like truffles, which have a unique taste, their flavour is difficult to describe because no other seafood tastes quite like urchins. Their flavour is vaguely similar to that of fresh mussels, but the comparison is a tenuous one. This just isn't the same thing as observing that, for example, cuttlefish, octopus and squid all have a similar taste. Italian fishermen often use soft white bread to scoop out the meaty centre of the urchin while trying to avoid any piece of shell or spine remaining from the chopping process and ending up inside. Obviously, it's ideal to harvest urchins in clear, clean water. Unfortunately, Sicily's coastal waters aren't as clean as they used to be, a factor that has reduced the level of edible algae - and with it the urchin population - in recent years. Then there's the problem of overzealous (and illegal) harvesting. Urchins are considered a cool-weather food. Here in Sicily you usually begin to find them sold in the middle of November, and by late April the "urchin season" is over. There are various recipes for urchin sauce. Most include sautéed garlic or onion (never both), the pulp of some fresh, chopped, skinned tomatoes (but not too much as this is not a tomato sauce), a touch of fresh parsley or mint (maybe even a dash of both), salt, freshly-ground pepper and extra-virgin (and unfiltered) olive oil. Perhaps a little butter. A guiding principle is that nothing should overpower the flavour of the urchin meat. The pasta should be vermicelli, spaghetti or (ideally) thin linguine - in any event a long pasta - of the best quality available; there's no substitute for fresh pasta.